This post is abuse of the moths blog since no moths feature in it, but I wanted to share my picture of an inquisitive goose. It saw Penny, myself and Olly off from the very fine Sun Inn in the Washburn valley on a soggy walk to Beaver Dyke reservoir and John O'Gaunt's castle. This has separate bits labelled 'Mild Sulphur' and 'Strong Sulphur' - see second picture below - but my Googling has so far failed to ascertain why. I don't think that the town's famous sulphur springs spread this far so maybe the fresh Pennine water from Beaver Dyke, filtered through the local sandstone, is used to dilute the foul stuff at the actual spa. The search will go on. 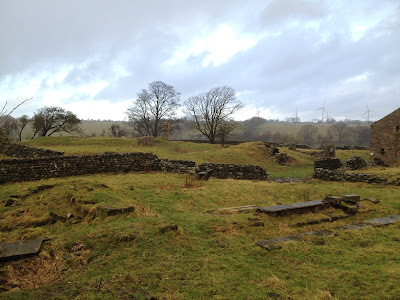 We really want to explore the fragmentary but intriguing remains of John O'Gaunt's castle too, a place where King Edward I stayed and presumably gazed like us on the driving mediaeval rain. 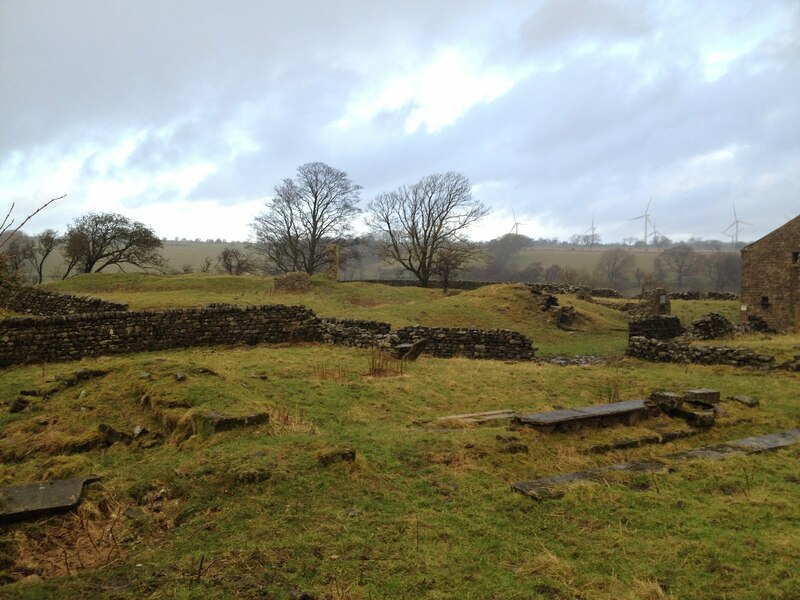 It was so wet and cold and the ground so sopping that we didn't even battle across to look at the noticeboard which you can maybe make out in the third picture on a stumpy wall to the left of the barn and below a shadowy wind turbine. The weather looks a lot nicer in the picture than it was but, thank goodness, it stopped raining on the final leg back to the pub where a really nice Dad, who got engaged to his wife at the castle, gave us his table by the blazing fire. It was so warm last night, in spite of our sopping Christmas weather, that I put the trap out for the first time in ages. Result? Nix, but then it had started getting wet again in the small hours which may have grounded any venturesome moths which had been on the wing earlier. 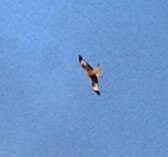 I can offer you this photo of another and very dramatic flyer, though: a Red Kite over our garden; only the second I've seen here, though they are advancing in all directions from their reintroduction centre at Harewood about six miles away. 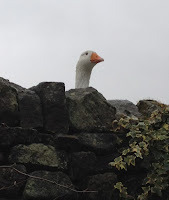 Some have been seen over the centre of Leeds where in mediaeval times they were familiar scavengers. Sorry it's rather a sketchy image; I cropped it from my original 'phone pic on which it was but a speck. Also, for any moths which may be reading, look at your new overnight resting place in the coming year: a 'Bronte Brown' eggbox. I keep an informal tally of things named after the famous literary sisters, which ranges from sunbeds to ice cream. The eggs weren't that brown, but half-a-dozen we got from the hens at Botton village near Danby on the edge of the North York Moors really are. They are a present from my lovely cousin Catherine who works there and came to our family party two days ago. As you can see, they are extra excellent because they were laid on The Day. I briefly thought we had a Christmas miracle here. We were moving furniture to put up the Christmas tree in its usual place and under an armchair, we found a little Winter Moth in the take-off position. Its body was arched, legs on the carpet and wings angled back, for all the world like a jet plane quivering on the back of an aircraft carrier. Given that Winter Moths can take half an hour to get going in cold conditions, I imagined that it was just nicely warmed up and ready to fly. But alas. No movement, and when I touched it gently with my finger, it toppled over. Long dead. 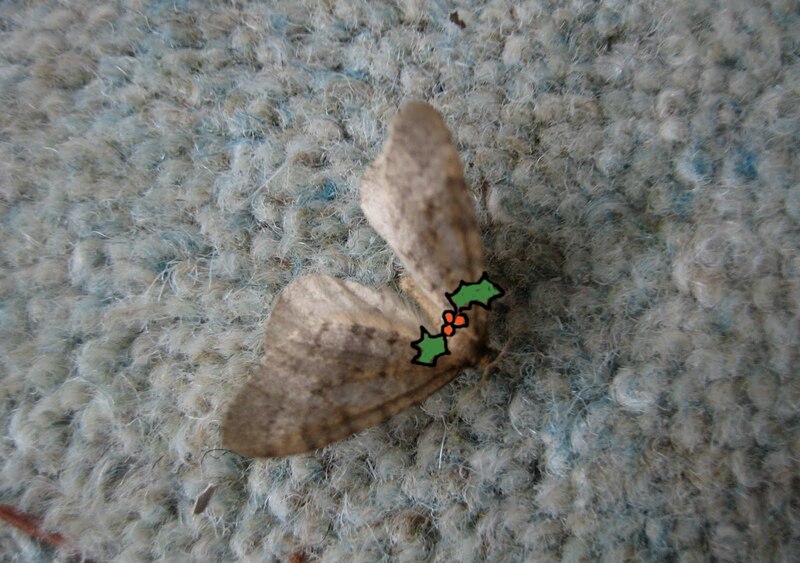 I have given it a posthumous Santa hat in one photo and a sprig of holly in the other, to wish you the merriest Christmas - from the Beyond, in the moth's case, and from the Here and Now in mine. And all the warmest wishes for the coming year. When you have a general clear-up and sort-out in the winter months, as we are doing, you are almost certain to come across a hibernating butterfly somewhere in the house. Sometimes it will be a Small Tortoiseshell but more commonly a Peacock. It will be very hard indeed to wake, so you can study it at leisure, although the wings are normally tightly-folded and the beautiful colours hidden. The habit accounts for the sudden appearance of butterflies during warm winter spells which in turn has led to stories and legends of their significance. The opening run of a play, with the ideal hibernating place of the theatre curtains suddenly disturbed, is a well-known example, supposedly boding well for the show. I don't want to try to be too scientific, for fear of spoiling such notions; but finding this Peacock in the picture, tucked deep inside a storage shelf, has set me wondering about predation, especially by mice - whose droppings were nearby as you can see - or spiders, which had built webs over the very front of the shelf. Sure enough, if you type 'hibernating butterflies' and 'predators' into Google, all manner of fascinating papers on this subject are to be found. It's too dark in the morning to trap these wintry days, and you may have read that poor old England is getting a thorough soaking too. But eagle-eyed Penny provides me with a moth even so, slumbering on one of our kitchen cupboards by the door hinge. 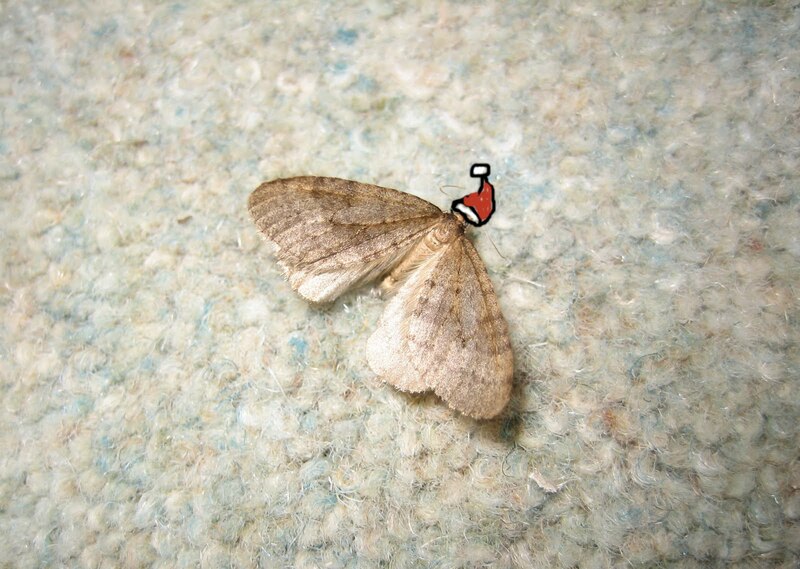 It is a Winter Moth unsurprisingly, a fascinating species whose 'blood' is akin to anti-freeze which allows it to thrive at this inhospitable time of the year. This one is a particularly impressive example of the survival of the fittest, having found its way into our cosy home. Or is it? Given that it has the means to survive outside, perhaps it is risking the weakening of its powers, and those of its descendants, by taking this superficially cunning step. You can read a bit more about the antifreeze side of things in this post from January two years ago. Barred Fruit-tree Tortrix (Pandemis ceranasa), Bird-cherry Ermine, Brown Grey (Scoparia ambigualis), Catopria margaritella, Diurnia fagella, Dipleurina lacustrata, Emmelina monodactyla, Garden Rose Tortrix, Green Oak Roller (Tortrix viridiana), Mother of Pearl, Plume (Stenophilia sp. ), Pyrausta aurata,Spindle Ermine, 20-plume, Ypsolopha Sequella, Brown Grey Moth, Garden Pebble, Acleris shalleriana, Light Brown Apple Moth, Eudonia mercurella, Meal Moth, Marbled Orchard Tortrix, Cypress Tip, Acleris forsskaleana, Phyllonorycter geniculella, Eudonia mercurella, Brown House Moth, Bramble-shoot Moth, Anania coronata, Green Oak Roller, Carnation Tortrix, Tinea trinotella, White-shouldered House Moth, Argyresthia trifasciata, Epiblema cynosbatella, Eriocranaria subpurpurella, Ancylis badiana, Blastobasis lacticolella. I haven't had time to put the micros in alphabetical order or give them their Linnean names but I will get round to doing that. As you can see, there are many more of them, thanks to my snazzy new Micro moth Bible. I'll do an overall count too, when I'm a little less tired, to compare with 200 on 18 June last year and 158 on 1 August 2009. My moth of the year is the Mottled Umber and I have stuck in a few recent pictures of some to relieve the listy nature of this post. Byeee, with a final picture of an underwing looking like a loveheart. Aaaaaah. One of my motives for moth-trapping, after the usual youth spent preferring butterflies, is the number of UK species; over 3000 compared with only 58 butterflies, many of which are seldom seen in Leeds. 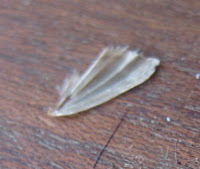 But at this time of the year, the number of moths on the wing shrinks dramatically. I've just been reading the very useful page about this on the website of Yorkshire Butterfly Conservation. They list only 24 ordinary-sized moths and 24 micros as the 'most common' in our vast county in November and I have already had 14 of the ordinary ones and a goodly number of the micros (which I'm afraid I don't study to the same extent - yet). I'm not expecting surprises for the rest of the month, although you never know. But I think that my rate of trapping and reporting will fall markedly between now and next March. It's been a poor English summer for weather but there has been plenty of interest in the trap, and I'd also like to thank everyone who has helped, commented or just clicked-in from a surprisingly large number of countries around the world. People such as Ben Sale of Essex Moths, Ray (Stokelymort) from Middlesbrough and many other fellow-trappers have been endlessly generous with their knowledge. And though I keep this record mainly for my own pleasure, it is astonishing to see from Blogger's stats where readers come from, eg Mongolia last month, Costa Rica often and most recently Palestine. Shukran! And Toda raba to frequent visitors from Israel (hope I've got those thank-yous right). May moths and other gentle hobbies keep or bring you together. Warmest wishes to one and all everywhere else. And here is the tally from last night: one Satellite, seen at the top of the post with a solitary December moth behind; and, just above, one Yellow-line Quaker (I am pretty sure; I have a bad track record with these and the - to me - very similar Red-line Q). And this: is it a weevil? It did a great little version of 'You put your left leg in...' etc, both on its back and when I pushed it gently over with a leaf so it was right way up. In the top picture, it's waving goodbye. As am I. All best for now! M.
After yesterday's delightful creatures, including myself when young, here's a brief visit to the other end of life. Dust to dust... We're engaged in an Autumn clean-up and clearout and discovered this sad debris of several moths in a long-neglected drawer. 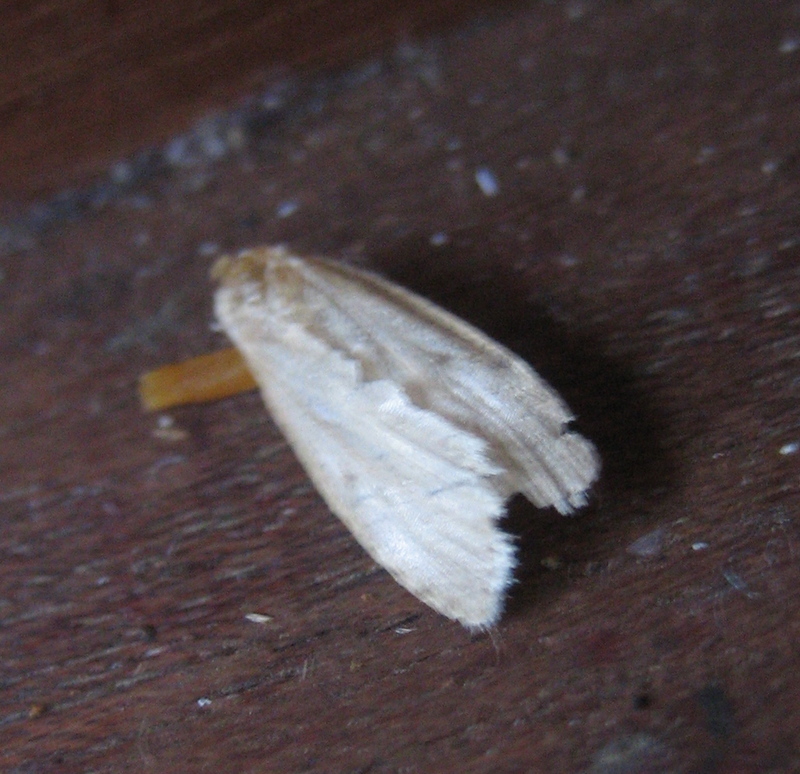 I think they will probably be one of the micro house moths whose ranks include the couple of clothes species whose appetite for fabrics, especially those such as cashmere at the high quality end, does such damage to the reputation of their thousands of wholly innocent moth relations. And here, below, is the biter bit. 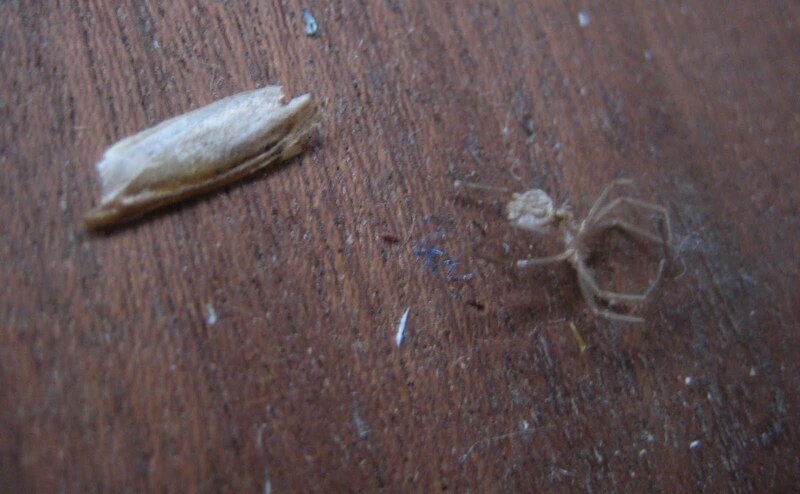 Beside the remains of one of its victims is the lifeless shell of a spider which probably starved to death under a pile of notebooks and Guardian stationery which has lain unattended for many years. RIP both. Morning! A warm and dry night and some fine moths as a result. Let's start with another good example of effective camouflage from one of my top late autumn visitors. 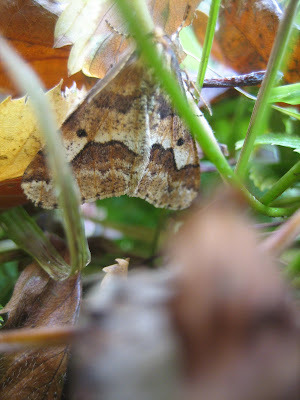 You'd have to be a clever bird to find this Mottled Umber tucked away among the fallen leaves. Now to the student drunks, which is how I think of the most comatose dozers in the trap. There were five December Moths - another very fine late season visitor - and here they all are. 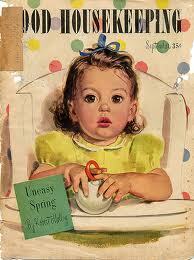 Here's a picture I came across the other day, just to buttress that point. 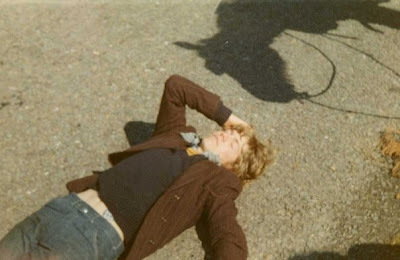 It was in Ireland in 1969 and I can tell you about the horse some other time. Equally squiffy, how about this Yellow-line Quaker which slid from its eggbox into the grass without moving a muscle, oblivious to all but its dreams. It seems appropriate that one of the December Moths when observed from an unusual angle, below, much resembles a tent. These stars of the night's party were joined by a couple of humbler guests. First this Common Marbled Carpet of the rather striking 'orange blotch' variety. The main form has a more dignified overall patterning, but I like the boldness of these ones. And finally a humble Tortrix micro of some kind, which I will identify this evening before falling asleep in front of the TV. They also serve who only sit and concentrate quietly on looking grey, or brown. Update - many thanks to the incredibly knowledgeable Ben Sale of Essex Moths who identifies this as Acleris shalleriana, adding that this one is very like its relative sparsana in appearance. Delving into such detailed joys will form part of my impending retirement. More of the same this morning, but I thought we could look at them from different angles. 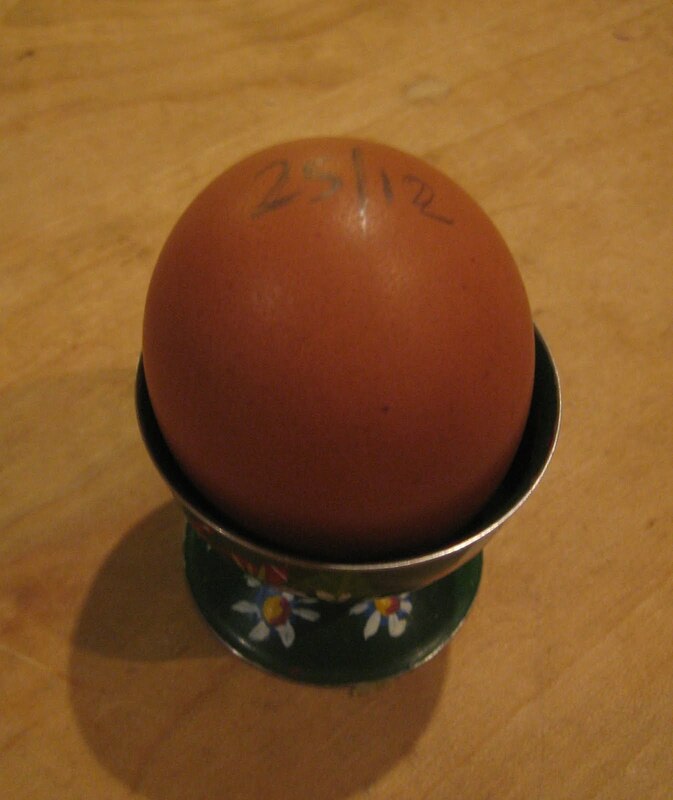 Here's another Blair's Shoulder Knot, for example, at ease on his eggbox. He reminds me of the Lion King (or, it must be said) possibly the Lion Queen. 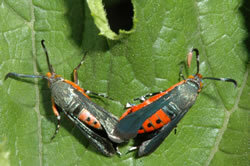 Sexing moths is generally a specialist business. And here's another Feathered Thorn showing his (or her) 'eyebrows', almost Denis Healeyish in their magnificence. Imagine if Healey had antennae too, like these. Finally, the regulars - the above plus Yellow-line Quakers, a December Moth, caddis flies and half-a-dozen Red-green carpets, had also invited this Spruce Carpet to their sleepover. It was another warm night but with quite a bit of rain, which seems to affect moths' flying much less than cold. This always happens. I was saying to Penny only this morning: "I think I'll pack up the trap for this season soon." Then I went down to the eggboxes and - shazoom! Moth after moth. Maybe to celebrate the result of the US election (and what a relief that was), this whole flight of December Moths has arrived a month early during a night which was blowy but relatively warm. Truth to tell, they can be on the wing from October onwards so their name has always been a little misleading. But aren't they fine? Much more striking in their fur coats than their modest counterpart the November Moth whose grey tunic you can observe several posts back. Meanwhile just look at the antenna on this one. Then there was this glorious Feathered Thorn, below. 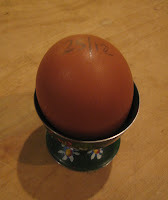 And isn't it interesting that it has perched on a similarly-coloured orange patch on the blue eggbox? One day, I will assemble all the examples I have of this apparent knowledge of a suitable 'camouflage' background (including the many instances of moths snoozing on black-and-white 'dazzle' barcodes) and ask an expert what they think about them. Finally, two familiar but always welcome regulars at this time of the year, both narrow and angular as some sort of high-performance fighter plane. First, a Blair's Shoulder-knot, which colonised the Isle of Wight as recently as 1951 and only reached the Scottish border in 1996. And then an Angle Shades. I could look at this moth for hours. Its attendant swarm of tiny flies seem to agree. 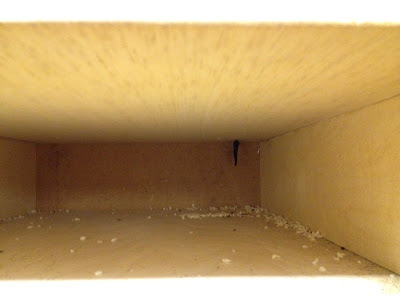 There was nothing in the trap last night for the first time in weeks, but there had been plenty of flying objects earlier on. Snap, crackle, boom! It was Guy Fawkes' night and we had lots of rockets and whizzbangs in our neck of the woods. That must explain this first-time observation, I think: soot on the metal collar of the trap's mercury vapour bulb. I have never seen that before and cannot account for it otherwise. 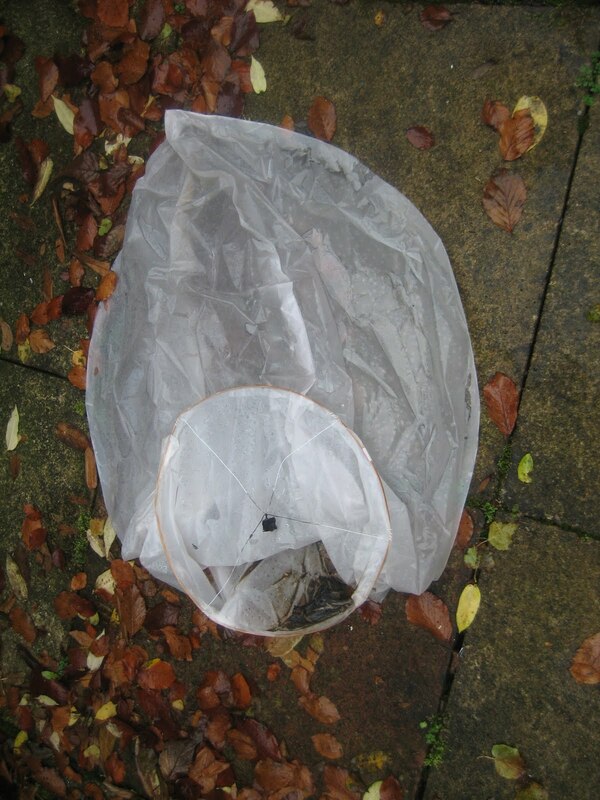 Another first: here is the corpse of one of the Chinese Flying Lanterns which are all the rage in the UK. We've often seen them glide past, soft and beautiful lamps in the sky, but none has made landfall before. I like them and worry about them in equal measure, probably because I learned about Sir Francis Drake's fireships at Cadiz (when he singed the King of Spain's beard). These are little aerial fireships and I'm afraid it's only a matter of time before one causes a tragedy. A committee is looking into them at the moment and I predict a ban. Penny and I have just had a magic weekend at Black Sail youth hostel at the wild head of Ennerdale, overlooked by the wonderful trio of mountains, Great Gable, Kirk Fell and Pillar, with hailstones drumming on the roof at night but sunshine blessing our walks by day. Here are a couple of pictures which show the Lake District's famously volatile weather in both moods: above the wintery background to the little hut, a former shepherd's bothy, as we set out to cross Scarth Gap to the fleshpots (relatively speaking) of Buttermere. And below, our parting glimpse as we walked out down Ennerdale with our heavy packs yesterday. I'll also just put in this picture of a rainbow over Buttermere which perhaps appropriately bridges the two extremes. 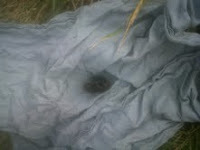 With us on Friday was Alan Sykes, a friend who farms at Talkin in the extreme north of Cumbria close to the Picts and Scots, who went for a walk up there on Saturday and emailed me this completely baffling photo of a caterpillar in what appears to be a Victorian christening gown. In fact, he told me when I inquired, it's his hanky. If anyone knows what the catty is - my best guess would be a Fox Moth which likes damp and cold moorland - I'd be much obliged. Back in Ennerdale, we found the very fine beast below which I think is a Ruby Tiger caterpillar. The valley has a famous niche in caterpillar history: last year, four thousand Marsh Fritillary catties were released in meadows rich with Devil's-bit Scabious to start a colony which I'm glad to say has so far survived. Some small but pretty visitors this morning, albeit unsurprising ones. There seems to be an inexhaustible supply of Red-green Carpet moths in this part of Leeds. There were seven of them in the trap and two posed obligingly in these contrasting 'flat' and 'furled' positions when I gently decanted them. 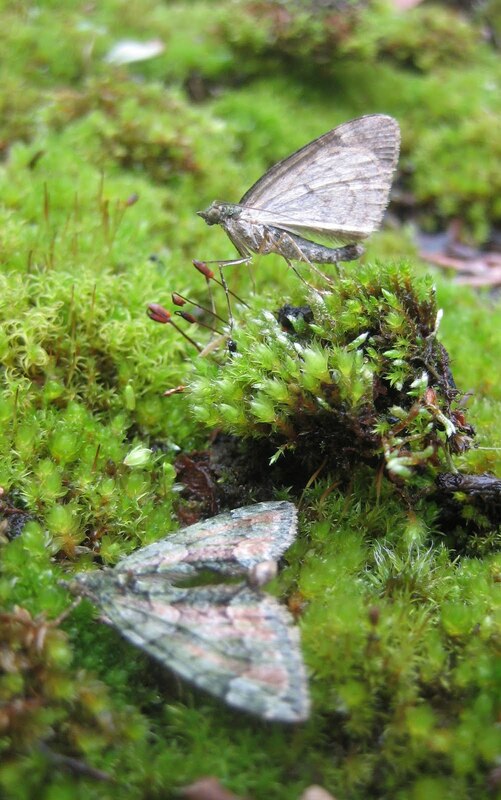 Alongside them was this Spruce Carpet and a solitary November moth. 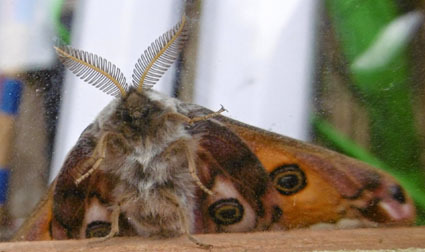 In terms of meteorology and its connection with moths' liveliness or otherwise, it was a windy night. Like the cold, that seems to keep them indoors, or inshrubs. At home. Happy Hallowe'en! I am following a pumpkin theme today, although the Leeds contribution is rather weak. It consists of this Satellite moth which arrived last night; one of the 'orange' versions whose flying saucer markings with their twin attendant satellites (hence the name) are the same colour as a Jack O'Lantern. Less plausibly, I might argue the same of this Yellow-line Quaker, cousin of the Red-line Q which featured here the other day. It's kind-of pumpkin-coloured, don't you think? Maybe more of a pale squash. Talking of squashes, the moth you get when you type 'pumpkin' and 'moth' into Google is the Squash Vine Borer, a brightly-coloured creature more like a wasp than a moth. It is a major pest and there are some riveting accounts of farmers and gardeners doing battle with it, such as this one on an enjoyable blog called Backyard Giants. The excellent picture of two of them mating below comes courtesy of photographer Jeff Hahn from Minnesota University's website. Wandering round Google also led me, as so often happens, to something irrelevant but interesting and enjoyable: to whit: this YouTube clip of a cat called Pumpkin and a moth. On that note, I'll leave you, and hope that your wizards and witches are benign and you have plenty of chocolate etc with which to ward them off.